Sometimes you leave the house and you realize you've forgotten something. Not your wallet or your sunnies, but something even worse...deodorant! Don't fret, my pet. Chances are you've got something in your purse that will do the trick: hand sanitizer. Yup! Hand sanitizer not only kills common germs on your hands but anywhere. So if you put it in your pits, it'll Kung Fu odor-causing germs there too, leaving you fresh. Don't get me wrong. I'm not a big advocate for hand sanitizer. I believe we need germs. I also think using soap and water is the ideal way to keep our hands clean. Still, I feel that on days when you need a touch-up on your natural deodorant or have flat-out forgotten it, this is a sweet secret weapon. I like EO Hand Sanitizer gel. It's made with organic alcohol, has moisturizing jojoba oil & glycerin, and is scented with essential oils not synthetic fragrances, so it's not as bad as standard antimicrobial sanitizers. How do you feel about hand sanitizer? Do you ever use it? 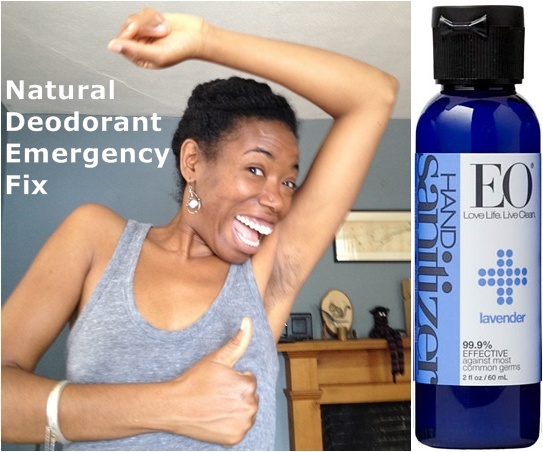 Have you ever used it as emergency deodorant?